The Flintstones was originally sponsored by Winston cigarettes. My pride and joy when I was in grade school was my metal lunchbox with The Flintstones on it. It had a yellow handle and the sides had a yellow stripe around the edges. The coolest part was that the picture on the top wasn't completely flat - it was bas relief - the characters and the Flintstone's car stuck out a little. And of course it included a matching thermos. You sound surprised. It was a different era when we were kids with different views on things. I think that (personal opinion only), since most kids did not choose what they would watch on TV (parents did), the sponsors were directing their marketing gig at the parents ... not trying to get kids to smoke. Heck, there were ads that had physicians sponsoring cigarettes (not certain, but I think it was Camels ot Lucky Strikes). Yep, it was a different era, and even though they had those cigarette ads on TV in what was generally considered "cjildren's viewing', I think most of us still tuned out pretty good. What's really hard to believe is that one of their original sponsors was Winston cigarettes! Remember when they had the contest on TV to name the Flinstone's new baby? The prize was a trip for a family of 4 to Disneyland in California. My favorite cartoon of all time! 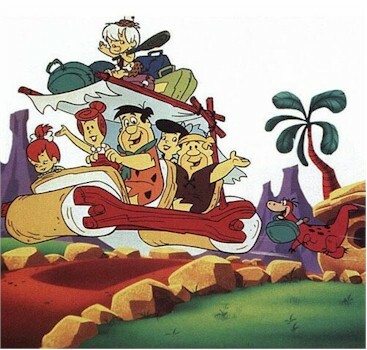 The Flintstones are like the cartoon version of the Honeymooners. I still collect all kinds of items from the Flintstones, toys, jelly glasses, bobbleheads, books etc. They are some of my most treasured items.